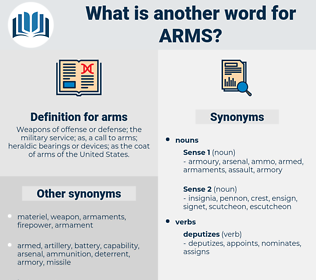 What is another word for arms? 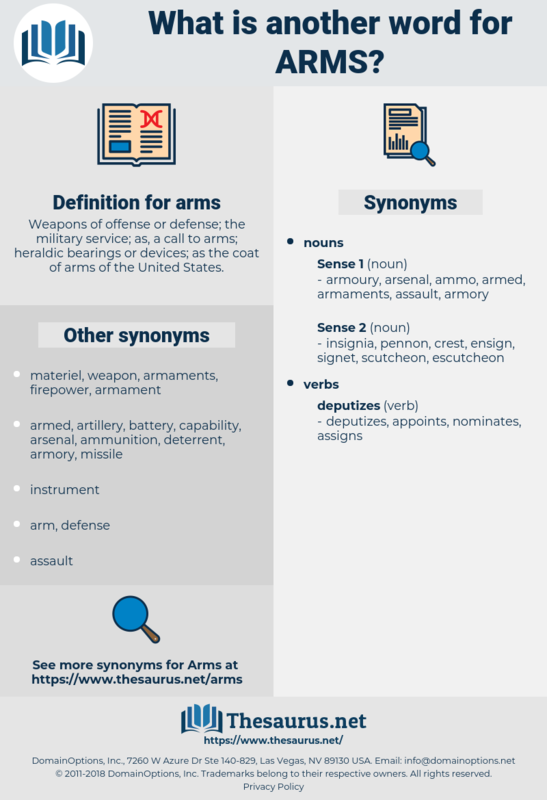 Weapons of offense or defense; the military service; as, a call to arms; heraldic bearings or devices; as the coat of arms of the United States. munitions, powers, tools, states, armed. arsenals, armies, Small-arms, Measures, shoulders, swords, Embargoes, missiles, agreements, specializations, forearms, Mercenaries, stockpiles, Resources, Soldiers, instruments, organisations, ramifications, chemicals, coats, terrorists, spheres, streams, calibres, revolvers, materials, Standards, comrades, Emblems, transfers, Cameras, restrictions, Subsidiaries, shooters, pistols, militants, warheads, jurisdictions, shields, crests, institutions, Capabilities, principles, blasters, pillars, ornaments, disciplines, containers, machines, Organizations, Areas, requirements, enterprises, inspectors, Reinforcements, generators, Rifles, segments, clusters, Environments, sectors, strands, handguns, regimes, heralds, directions, speakers, Shotguns, computers, warplanes, flames, rules, dimensions, Dependencies, Outbreaks, bullets, ingredients, Movements, allegations, departments, controllers, Opportunities, components, systems, groupings, levers, Factories, individuals, offshoots, vessels, Races, fires, clashes, processors, inspections, programmes, obligations, instances, Capacities, aspects, dangers, men, browsers, Programs, sensors, chapters, detectors, domains, Vehicles, trains, bursts, bows, Classes, affiliates, Bodies, sides, invaders, gunmen, divisions, Activities, antennas, sticks, sections, forks, BOMBS, GATS, limbs, Trees, approaches, Industries, utensils, tiers, Feet, methods, PATHWAYS, media, orders, Forms, norms, Tracks, pieces, avenues, officers, Shots, MINES, sizes, rods, Parties, objects, Plants, Agencies, Ones, Forums, months, subjects, items, schemes, levels, Entities, controls, pleas, Facilities, agents, panels, tubes, Traps, calls, modes, twigs, groups, Backs, sites, inlets, plans, runs, guides, kinds, offices, events, types, units, munitions, BRAS, LINEs, powers, armements, tools, states, hands, armed. reported, determined, banned, destroyed, led, needed. I'll see how well you know the man'l of arms. What if she went in some one's arms? arnica, ARNG, air mass, araneus, arming, arenga, arrange, arrhenius, aramaic, awareness, arenaceous, aramus, arm's, Aranyaka, ARMES, airiness, airing, arminius. ammunition, Defence System, defense system, gunnery, bomb, ammo, hardware, armament, naval weaponry.